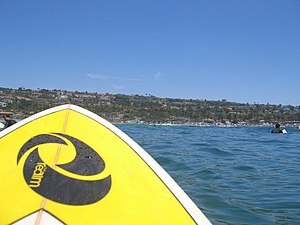 If you are looking for a surf trip of a lifetime you need to make your way to San Diego and its 75 miles of coastline. You will find in San Diego a multitude of options for one to choose from. Most of the breaks in San Diego break southwest but you do have a few reef breaks that will work to the west, south and the north depending on the swells. So what are you waiting for time to book a night at the Grande Colonial and get going. By the way the Grande Colonial is the spot for luxury rooms by the water in San Diego and if you’re coming out why not stay in style. Let us look now at a couple of the best stops to hit when surfing in San Diego. No matter what time of year it is Del Mar is breaking. You will find a mix of sandy bottom breaks and reefs to enjoy. This is a popular spot but the break is large making it easy to find a wave to ride. Next is Black‘s Beach which to some is considered the best waves in San Diego. Again this is a break that is ready year round to surf. You will find that each of the breaks is long and organized. You better be in shape when you hit Black’s Beach as you need to hike down the cliff and paddle a little further to get to the breaks compared to other spots in San Diego. If you are looking for reef breaks then you must head down to Windansea when the time is right. The water hear will be calm most days but if you are lucky enough to be in town when it’s breaking you are in for a treat. Make sure to check the local surf report before heading up. For beginners you should head off to La Jolla Shores. Here you will find many of the surf schools and kids learning on the waves. The reason for this is that there are year round lifeguards and a consistent but calm break to enjoy. Do stay away from Swami’s though. You will find a good break here but the crowd is usually huge here making it hard to catch a wave. If you do come out try and come early or late to miss the rest of the tourists. Surfing in Sand Diego is an experience you won’t forget quickly.